An earlier post ("Cajon 2016: Before the Fire") contained images taken about two weeks before the Blue Cut Fire of August 2016. This post contains photographs taken in April 2017 -- after containment of the blaze and also after the severe California winter rains of 2016-17. As is the case with all range fires, grass comes back strong and green with sufficient rain. Bushes will sometimes come back from the roots but more often are regenerated through seeds. Trees are the most unusual. Range fires do not burn trees uniformly. Most die but many survive, often in the strangest places. Those that die will not return for a generation. All is illustrated in the following images. To provide context, I have also included a few photographs of the landscape before the blaze. 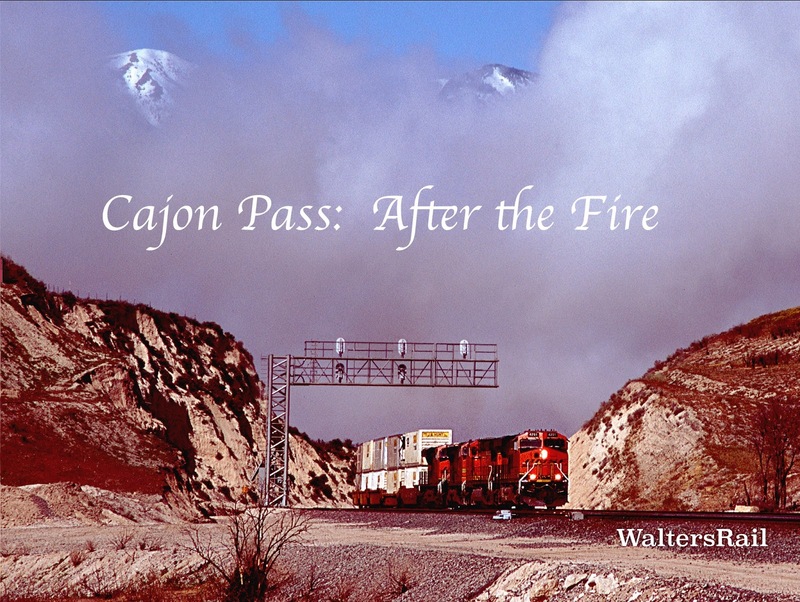 Cajon Pass, indeed most all of the western United States, has endured countless blazes in the past and will suffer countless more in the future. But the earth is resilient; it will be here long after we are gone. 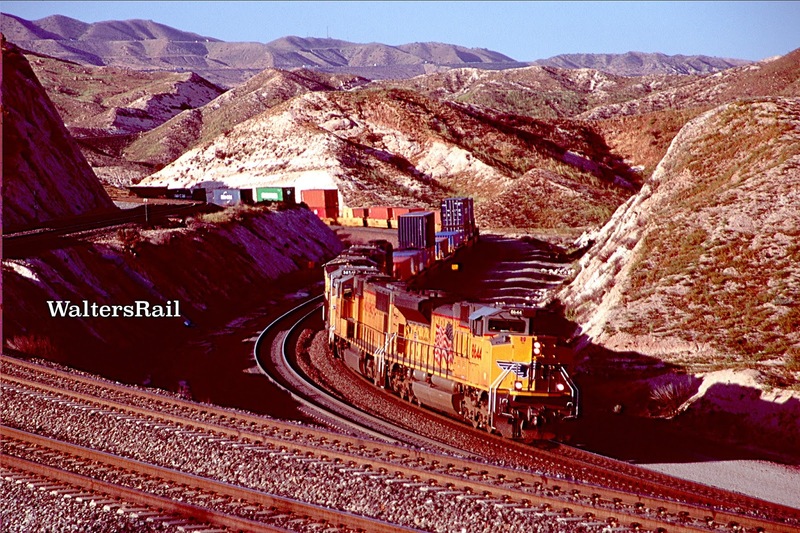 BNSF westbound stacks have left Sullivan’s Curve and are approaching the big turn to Blue Cut. Everything in the foreground was wiped out by the fire, including all trees in front of the train. This image was taken from a Forest Service Road on the east side of I-15, where the blaze did not reach. For reference, here is the same location immediately before the fire – August 2016. The Blue Cut Fire started on August 16, 2016, at 10:36 a.m. along old U.S. 66, north of Kenwood Avenue and west of Interstate 15, and quickly spread up Cajon Creek toward Blue Cut and the San Gabriel Mountains. At the peak of the blaze, 2,684 firemen from across the United States were in action. By 3:00 p.m., less than six hours after the initial burn, the blaze had spread north and east to over 5,500 acres, forcing evacuations and the closure of the BNSF and UP lines, as well as California 138 and Interstate 15. By Thursday, August 18, the fire had grown to over 31,600 acres and forced the evacuation of over 82,000 people. On Monday, August 22, fire officials said they had the fire 89 percent contained. The damaged area had grown to 37,000 acres. Officials declared the wildfire fully contained Tuesday, August 23. The blaze destroyed an estimated 105 homes and 213 other structures in San Bernardino County and now ranks as the 20th most destructive wildfire in California history. Here is another view from east of I-15, showing the devastated portion of the pass across the Interstate, with the unburned portion in the foreground. The images in this post are arranged geographically from where the fire started to the summit of Cajon Pass. The blaze burned up the grade and into the desert highlands at the summit. When these images were taken, the Forest Service had closed all the devastated areas with the exception of the Pacific Crest Trail. All the following photographs were taken from outside the quarantined area. This image shows the southern-most extent of the blaze. You can clearly see the line between the green trees and bushes and the barren hillside, which looks somewhat green where new grass is growing. This is where it all began. Notice also the proximity of the fire line to the dwelling nestled in the trees. Can you imagine the anxiety of the property owners? I can, because a few years ago, a wildfire came within a half mile of my house. The firefighters who stopped the blaze are now my heroes. 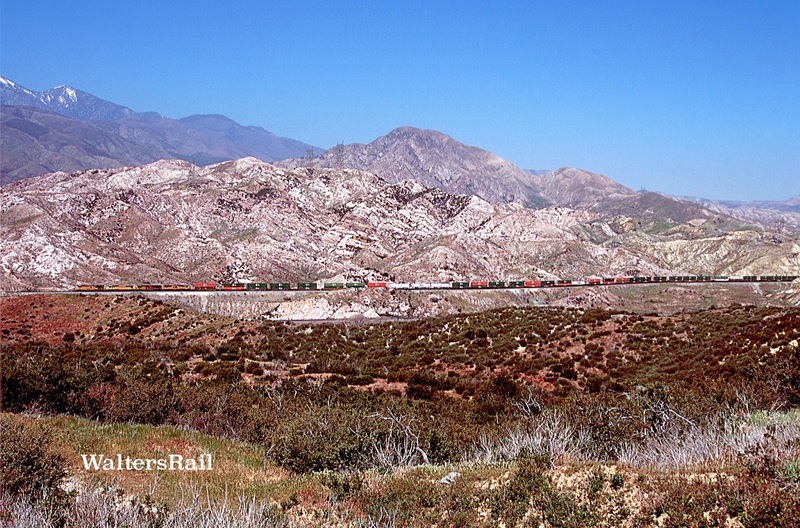 Late-running Amtrak #3 passes BNSF stacks in Cajon Canyon – beside Cajon Wash. Green grass has sprouted on the ridge, but most, though not all, of the trees and bushes have been lost. 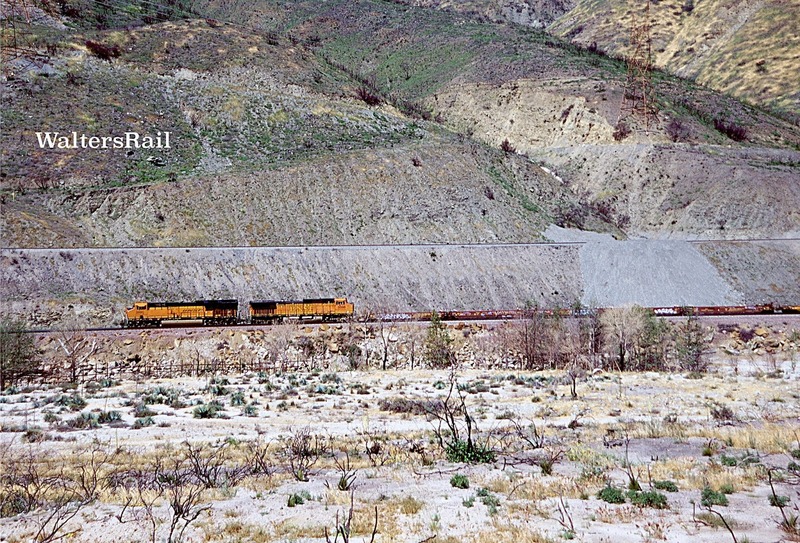 Notice also the amount of silt that has run down the ridge and collected behind the BNSF power. With no vegetation to retard the heavy winter rains, significant erosion occurred, which is how mountains eventually return to the valley. This image was taken from the ridge on the east side of the canyon, where the fire did not spread. Here, Cajon Wash provided a firebreak; vegetation on the east side of the wash was undamaged. This image was taken from one of the Forest Service roads that stopped the blaze from spreading west. Everything in the photograph has been burned away with the exception of some foliage along Cajon Wash and, in the left center, a ranch house surrounded by trees and green grass. Somehow the firefighters saved this property, which sits on a hill above the curve where trains running compass north turn east to Blue Cut. I met the owner one afternoon. He had come out to run me off, but when he saw I was photographing the railroad, he smiled and said I could stay. His house is located in the middle of the San Gabriel National Forest, the federal protectorate that keeps Cajon Pass safe from the metastasizing development that has overrun the Los Angeles Basin. He told me that the property had been in his family before the national forest was created. As long the property stayed in his family, it would be a small island within the National Forest. His property was fenced. Inside were three extremely friendly Golden Retrievers who exploded with happiness when I took my dog Bear, aka Mighty Dog, out of my rented Tacoma. Bear walked over slowly and peed on the fence. The Retrievers began peeing on the fence. If I were a dog, I would also have peed on the fence. 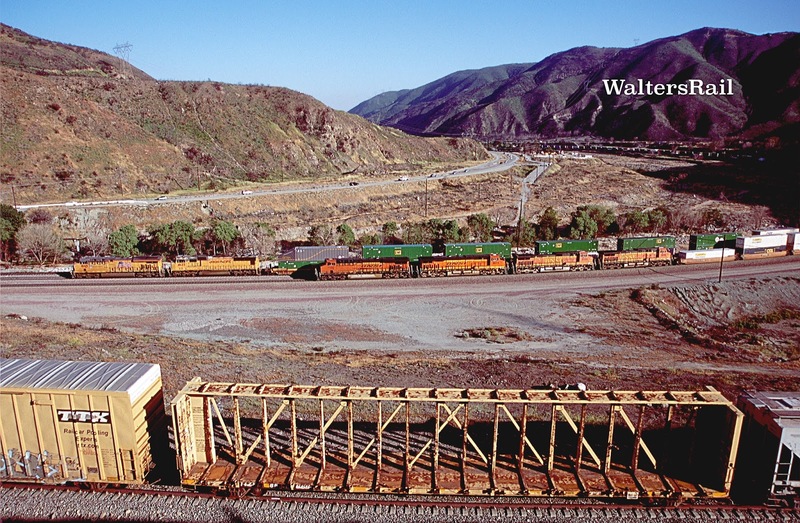 Westbound BNSF stacks meet eastbound UP autoracks beside Cajon Wash. Blue Cut is around the curve at the top of the image --just below I-15. Almost everything short of that highway was devoured by the blaze – save for some trees in Cajon Wash and the houses across the wash beside old US 66 (another incredible job by the firefighters). In the foreground is some of the silt washed down during the winter rains. Notice the flat valley in the background of the above two images – the San Andreas fault. 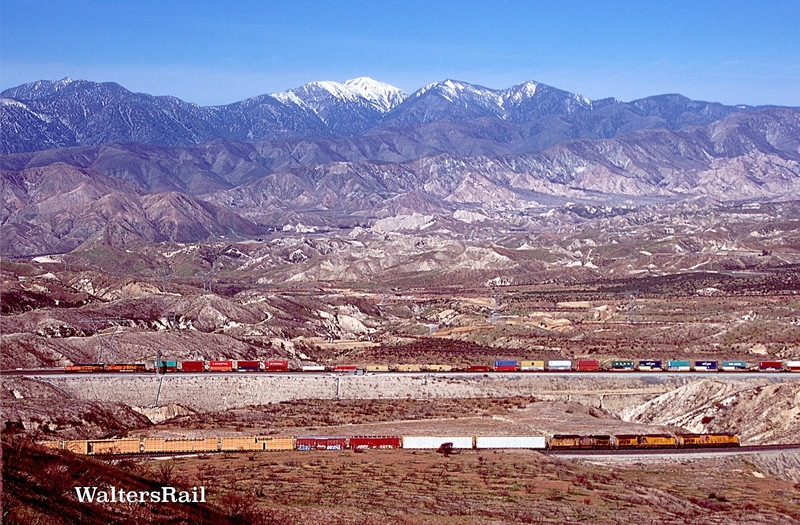 The BNSF triple-track mainline, the UP Palmdale cut-off, Interstate 15, old US 66, as well as several high pressure gas lines and high-voltage electric lines, all cross the fault in the same location, which is called Blue Cut. When the fault slips again, there will be some serious consequences. The burned trees on the mountainside speak for themselves. This next series of shots was taken from in front of the fence with the Golden Retrievers. The photographer is looking southeast where the mouth of Cajon Canyon opens to San Bernardino. 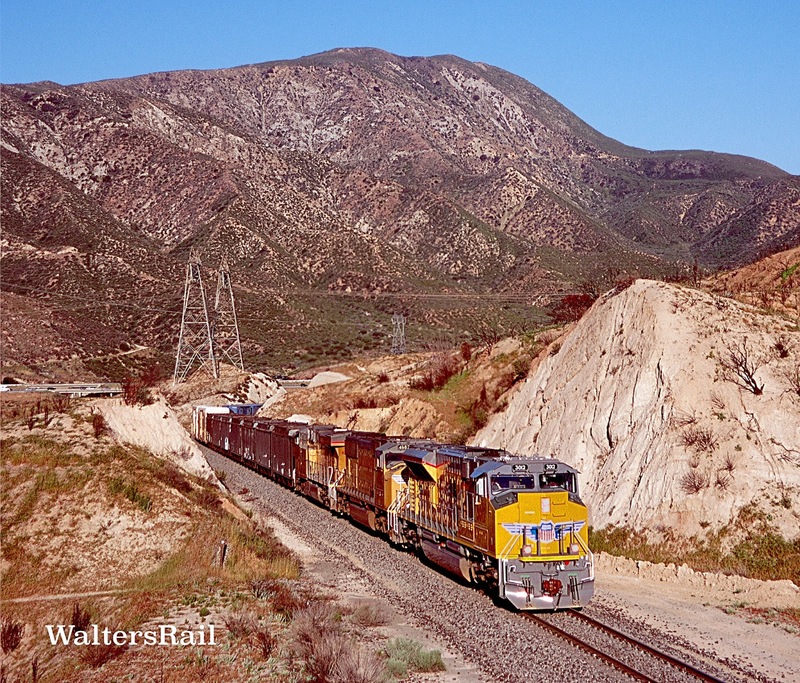 Here eastbound BNSF stacks are climbing the grade toward Blue Cut and the San Andreas Fault. 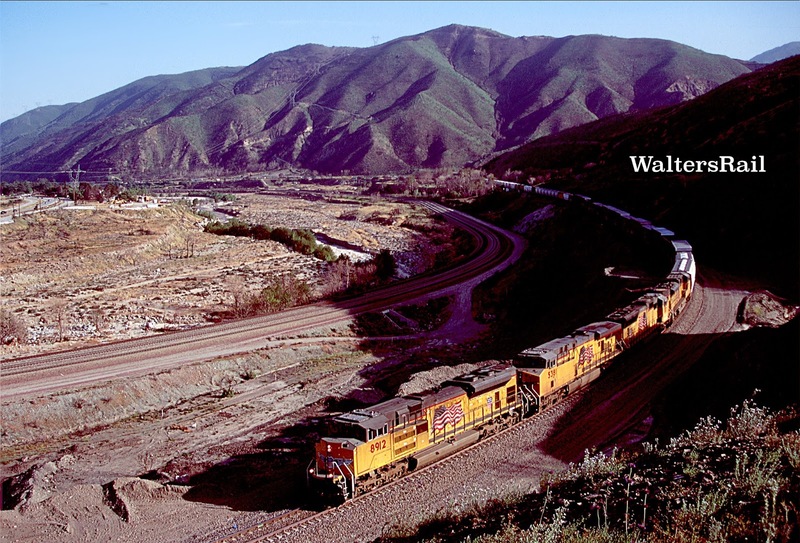 Cajon Wash runs immediately beside the triple-track mainline. In late April, there was still water in the stream – unusual for southern California and indicative of the heavy winter rains. At one spot along the wash, I saw a fellow who appeared to be panning for gold. Really! In 2017! 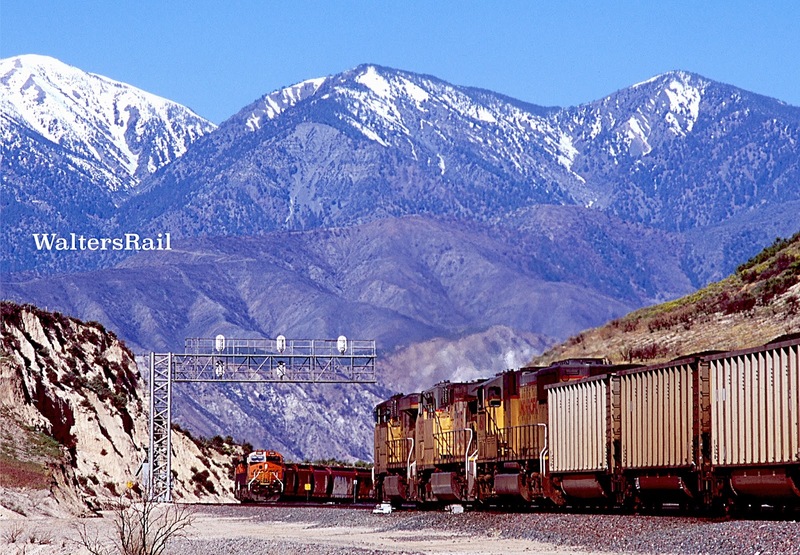 UP’s Palmdale Cut-off runs on a higher grade between photographer and train. Notice how most of the trees in the wash survived the blaze, though some did not. Beyond the stream is old Route 66. Everything around the highway and beyond was completely burned. If you look closely, you will see several of the high voltage electric lines running through and across the canyon. The huge metal towers supporting the lines all escaped damage in the blaze, though I understand that some towers are being re-supported at ground level because of severe erosion. 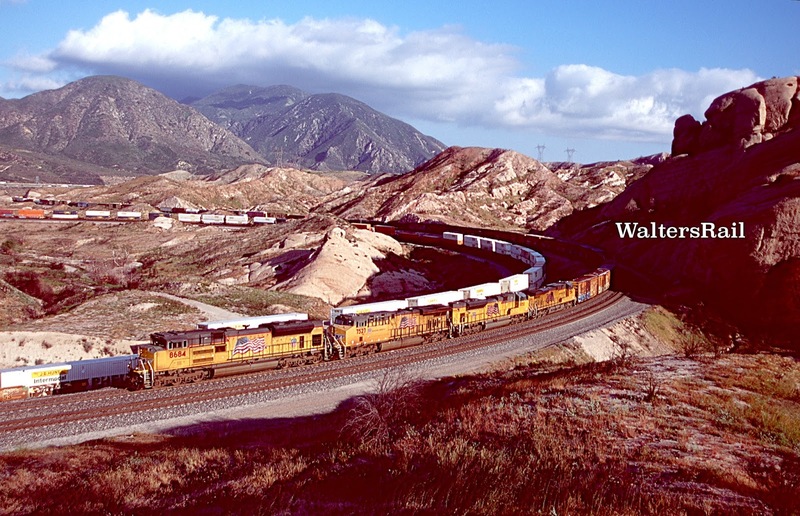 From the same location, here is an image of three trains. Eastbound BNSF stacks are overtaking eastbound UP stacks, both trains grinding into the grade, while in the foreground a westbound UP manifest, dynamic breaks whining, rolls down the Palmdale Cut-off. In the right background is a portion of the San Gabriel Mountains not burned in the blaze. 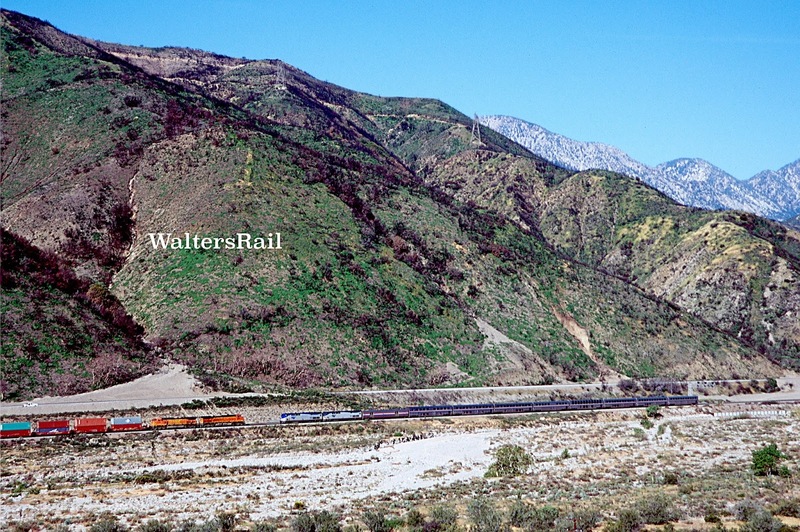 Compare their greenery to the ridge on the left above the trains. Eastbound UP stacks on the Palmdale Cut-off are passing the mid-train units of a westbound UP stack train approaching the mouth of Cajon Canyon. Notice the burned vegetation in the lower right quarter of the image. The policy of banning fires in national parks and forests began in 1886 at Yellowstone National Park and was incorporated in the National Parks Act of 1916. Fire suppression was based on claims that fire damaged trees, killed seedlings, promoted floods and erosion and destroyed shelter for birds and animals. Early researchers in the South contested these claims, pointing out that controlled burns helped establish pine trees, suppressed hardwood competitors, reduced hazardous underbrush accumulations and controlled forest diseases. So during the 1920’s to the 1940’s, the Forest Service began to realize that, at least in the South, controlled burning was beneficial. In 1955, the McGee Fire burned west of Kings Canyon National Park and in just a few hours consumed over 13,000 acres of brush and forest and threatened the Grant Grove of giant sequoias, which led a number of scientists to question the old paradigm of fire suppression and conclude that in the sequoia-conifer forests, periodic fire is valuable, because it allows germination and survival of sequoia seedlings, as well as clearing out the underbrush that had fueled the McGee Fire. What the Forest Service came to understand is that unexamined fire suppression had clogged western forests with underbrush that was fueling gigantic fires in the 1950’s. Ironically, by trying to prevent fires, the Forest Service was making them worse. So the policy was changed to allow controlled burning under certain circumstances which are constantly reviewed and re-evaluated. Today (2017) the Forest Service sometimes starts burns to control undergrowth. I saw a controlled burn in the Ponderosa Pine forest near Flagstaff in 2014. But the Blue Cut Fire was not a controlled burn, and the authorities immediately understood the need to put it out. 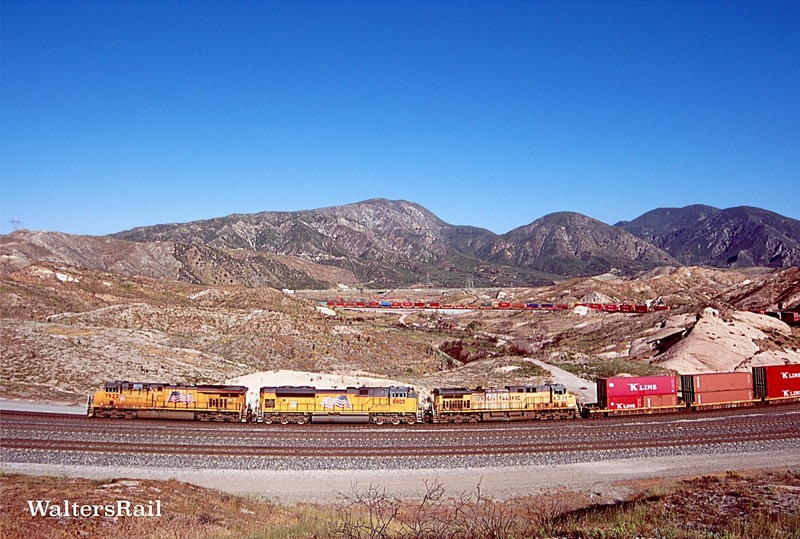 UP 8912, an SD70AH, leads an eastbound manifest up the Palmdale Cut-off near where the Blue Cut Fire began. 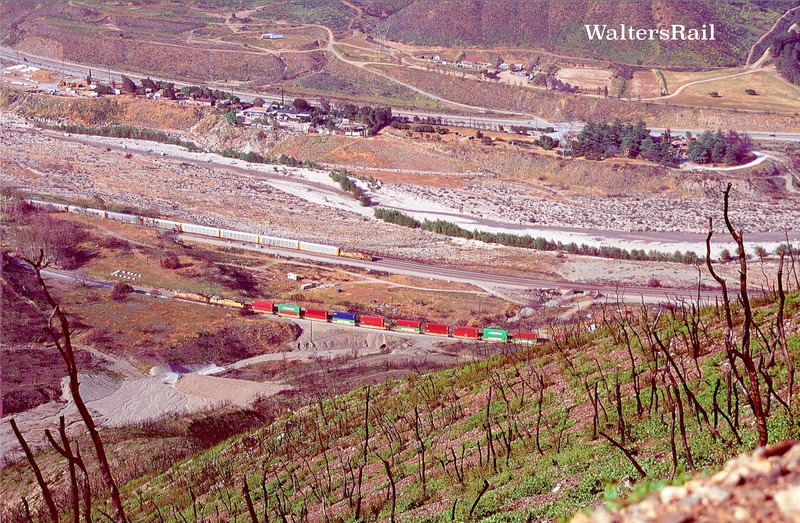 During the heavy winter rains, this was the location of severe erosion on the UP tracks, some of which can be seen in the lower left of the image. The photographer is standing near the homestead that was saved by the courageous and skillful firefighters. 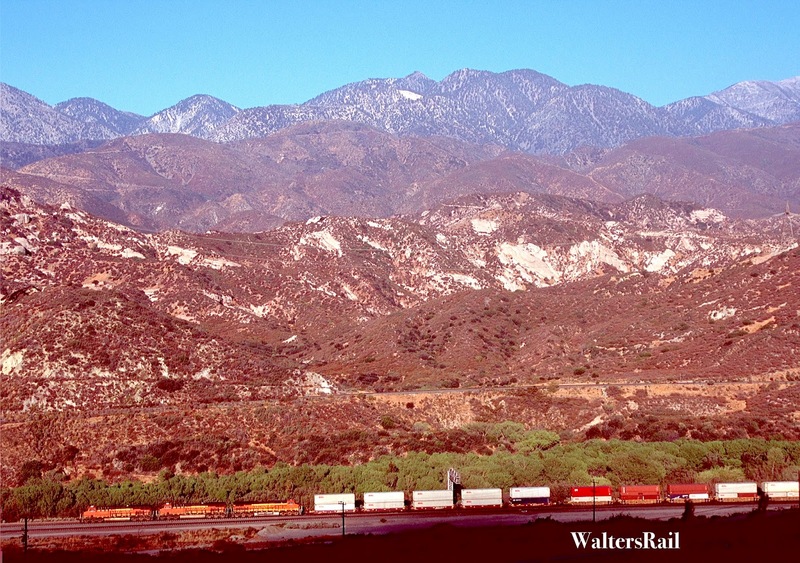 The lower end of Cajon pass consists of a huge alluvial deposit two miles wide, about 5 miles above Devore, the gorge through which is know as Blue Cut. Much of the rock is schist, a major part of the terrain southwest of the gorge. Schist is formed generally by mud and silt under extreme pressure and temperature, often containing large crystals that reflect light. At Blue Cut, the rock appears greenish to my eyes, so I do not understand how the name derived. The image below looks east into Blue Cut. Old Route 66 runs beside a huge slice in the schist, which originally flowed down from the mountains as mud and silt, much like the deposits washed down during the winter rains of 2016-17 – except on a much grander scale. Here a UP manifest in dynamic breaking is overtaking a BNSF manifest, also in dynamics, on the triple-track mainline to the right. 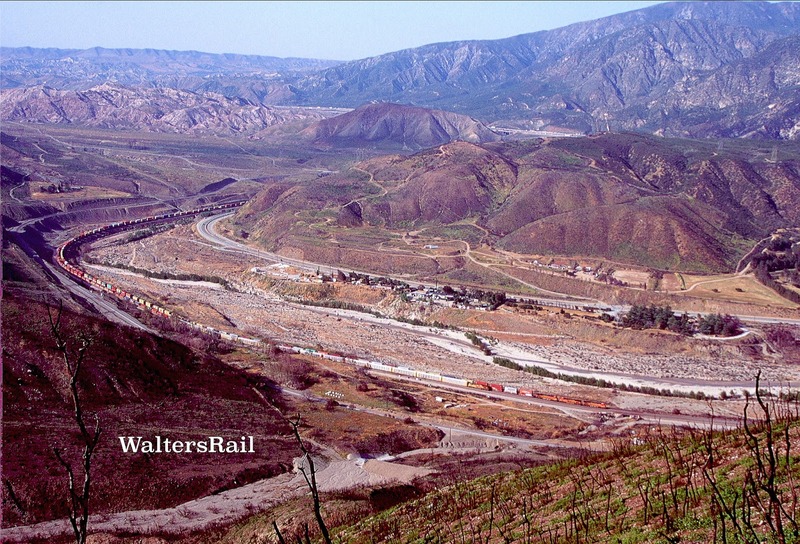 Notice that the water course beyond the tracks has narrowed significantly and in this part of the Canyon is called Cajon “Creek,” as opposed to the Cajon “Wash” that fans out in the broad canyon below. Notice also that about half the trees in the stream were killed in the fire, while about half survived. Vegetation on the alluvial deposit fared worse, though some creosote bushes survived. The San Andreas Fault is located in the valley directly beyond the slice in the schist – the location where the Pacific Plate and North American Plate are sliding past each other in opposite directions. Uplift from this slippage has produced the San Bernardino Mountains in the background, as well as the San Gabriel Mountains -- out of sight behind the photographer. The Blue Cut fire burned north up the San Andreas Fault into the high desert. The road up the fault – Swartout Canyon Road – was allowed to remain open by the Forest Service in April 2017, though all side roads were closed, including the entry to Lost Lake, a “sag pond” directly on top of the fault that was significantly replenished by the winter rains. 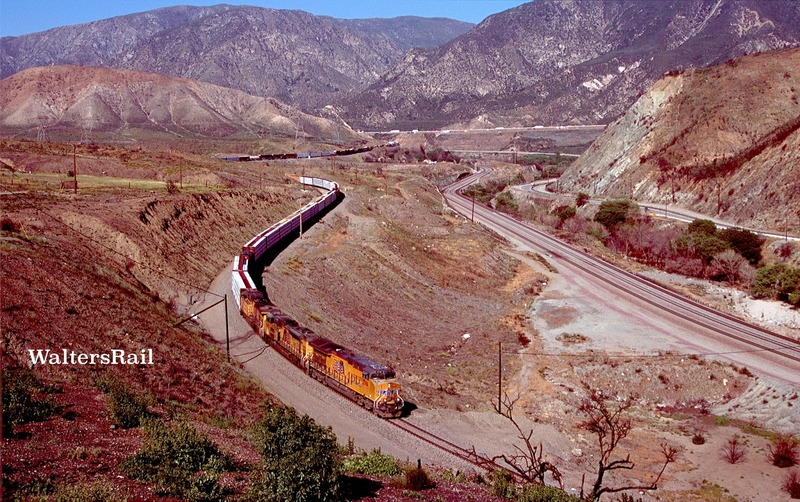 After the BNSF triple-track mainline and the UP Palmdale Cut-off run east past Blue Cut, they turn north through Cleghorn Canyon, which suffered some of the most dramatic damage from the conflagration. 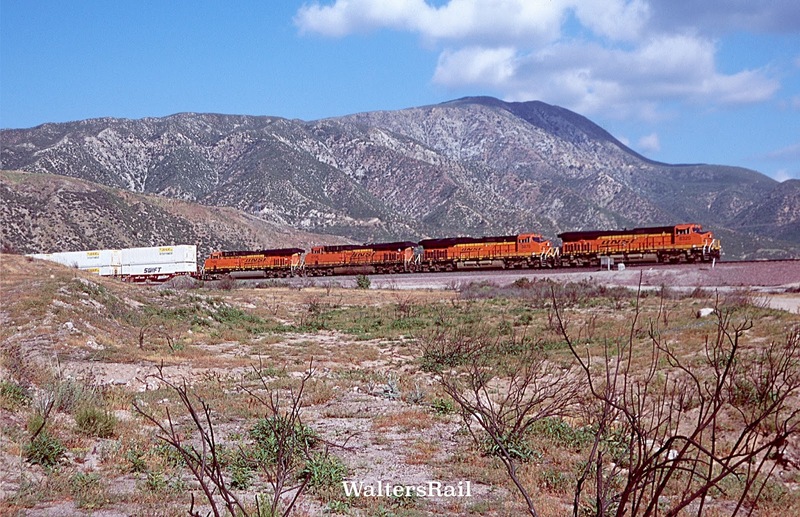 Eastbound BNSF stacks on the triple-track mainline pass a westbound UP merchandise freight on the Palmdale Cut-off in Cleghorn Canyon. Every tree in Cajon Creek has been burned. 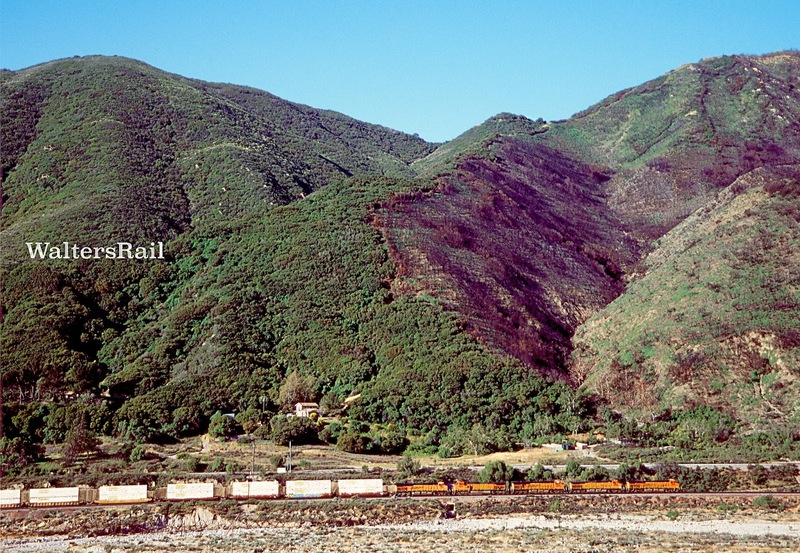 All the grass and bushes on the ridge above the trains have been burned. The second ridge in the middle of the image has also been burned. Virtually nothing is left. 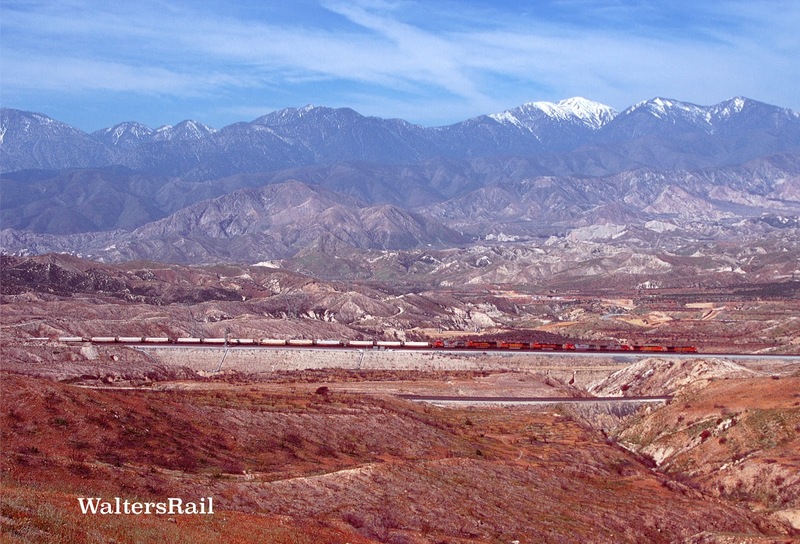 Only the peaks of the San Gabriel Mountains in the background escaped the devastation. 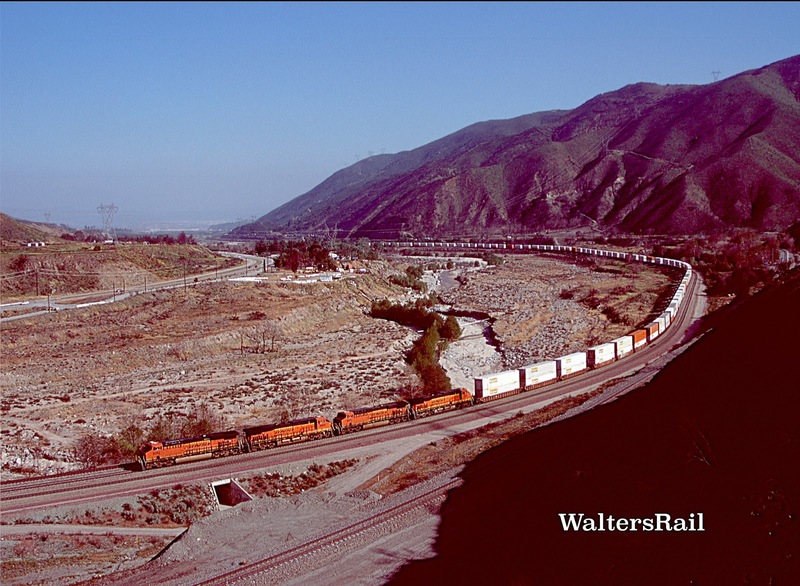 UP races BNSF stacks up the grade in Cleghorn Canyon. The lower quarter of the image shows the burned trees in Cajon Creek. New grass has begun to sprout up the hill. Virtually all other vegetation is dead. According to California Place Names, by Erwin Gustav Gudde, University of California Press, 1960, p. 67, Cleghorn Canyon was named for Mathew Cleghorn and his son John, who leased land in the area in the 1870’s for a lumber business. I have trouble imaging a lumber yard in Cajon Pass, but what do I know? East of old U.S. 66 and I-15, the Cleghorn Ridge Trail climbs high into the peaks and ends at Silverwood Lake State Recreation Area. I have driven portions in my Jeep Wrangler but have never taken the 2 ½ to 3 hours necessary to reach the lake. Several of the images in this post, including the ones above and below, were taken from the trail – high above the canyon and rail lines. I don't think I can say much about Sullivan's Curve that has not already been said, so I will confine my comments to a discussion of how I approached this location in a portion of the San Gabriel National Forest that had been closed to foot and vehicular traffic. An exception to the prohibition was the Pacific Crest Trail, which crosses the highest portions of the Sierra Nevada and Cascades, running from the Mexican to the Canadian borders. Open only to hikers, horses and dogs, the trail is 2,659 miles long and varies in elevation from near sea level at the Oregon-Washington border to over 13,000 feet at Forester Pass in the Sierra Nevada. The route crosses 25 national forests and seven national parks. In Cajon Pass, the trail comes down the San Bernardino Mountains from Silverwood Lake and passes under I-15 at the Santa Fe and Salt Lake Trail Monument, which can be reached from the California Highway 138 exit off I-15. Head east of the Interstate a very short distance and take the first road south – Wagon Train Road. You will pass a Chevron station and a McDonald's. The road dead-ends near the bottom of the grade. You can park at the dead end and follow the path down until you reach the Pacific Crest Trail. Be warned that the beginning of your hike will take you through a curving tunnel beneath I-15, long enough to be almost dark in the middle. When my dog Bear and I hiked through the tunnel in April 2017, water from the winter rains was still running down from the San Bernardino Mountains beneath the Interstate Highway and emptying into Cajon Creek, so we kept to the edge of the passageway to avoid the mud, sand and water in the middle. Bear stopped multiple times to dig into the sand, as though he thought he might capture something. To my knowledge, the only thing that Bear has ever captured was a fledgling Kildee (a bird that nests in the ground). Bear killed the baby but did not know what to do with it, so he brought it to me as a present. The trail followed the stream a short distance through the sand, then turned south and began a slow, twisting climb up low hills. Around us were the burnt remains of creosote bushes and scrubby trees. But beneath these ruined hulks, green grass has started to sprout from the sand and clay, giving the countryside the strange appearance of new life bursting through the remains of the dead, like baby spiders eating their way out of innards of their dying mother. Bear and I followed the trail steadily upgrade. The path was about three feet wide, and in places the footholds were narrow. Around us, the stalks of burned creosote bushes stood up from the ground like the spikes of black lizards. 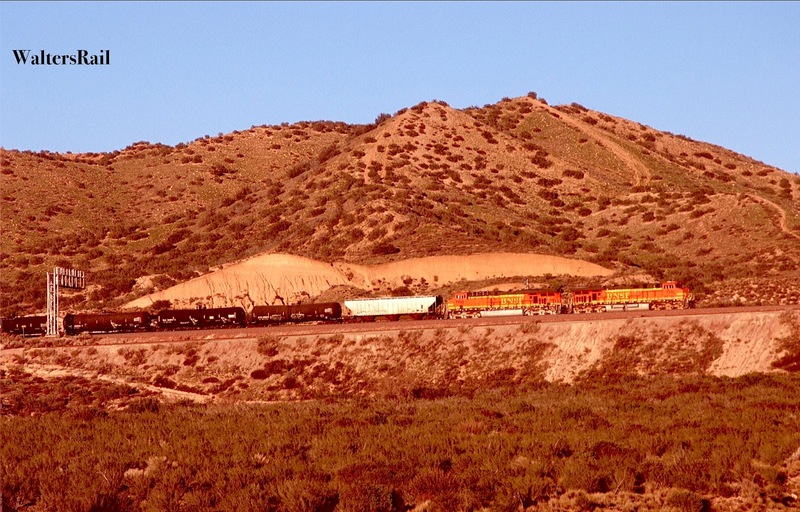 Then the trail turned downgrade just as a BNSF stack train appeared, struggling into the hill. I took the shot below. 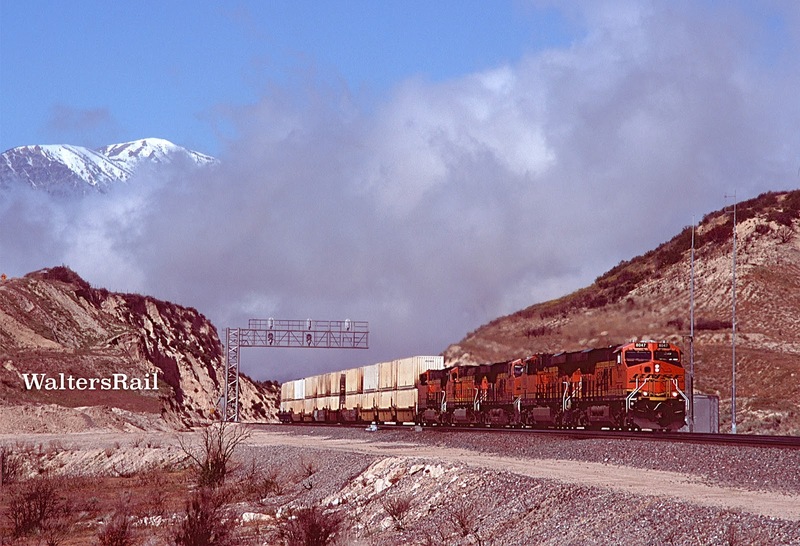 Eastbound BNSF stacks are approaching Sullivan’s Curve. The photographer is standing on the Pacific Crest Trail, while Bear the Mighty Dog absorbs the myriad smells of hikers, horses and hounds who have passed before. The trail continued down to the dry bed of a stream that fed into Cajon Creek. The sand was especially deep, and Bear and I trudged ahead until we came to a culvert that led beneath the double-tracked BNSF mainline. The tunnel was round, bottomed with smooth pebbles and more sand. When we emerged from the south end, the trail turned steeply uphill, leading us to a crossing of the UP line (the old SP Palmdale Cut-off). Dog and human continued upgrade until we found a spot above both the UP and BNSF lines in the middle of the curve. Bear knows better than to ask that question. So he hunkered down in the sand between two burned bushes and waited patiently while the old man set up his tripod. Bear has learned that whenever I have a camera, a train will soon appear. His ears were perked. Soon we heard a westbound in dynamic breaks, rolling downgrade. I turned the camera to the north and took the image below. Westbound BNSF stacks roll downgrade at the entrance to Sullivan’s Curve, while Bear the Mighty Dog crouches to avoid the wind. 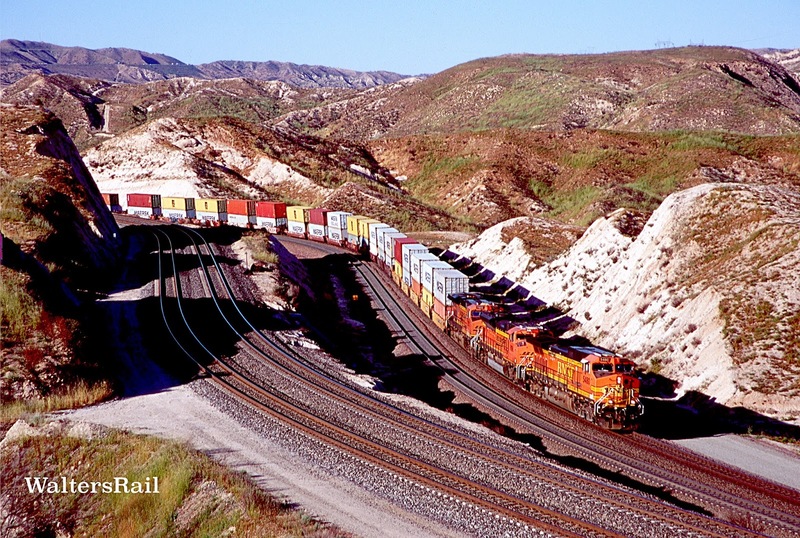 Eastbound UP stacks climbing the grade in Sullivan’s Curve on BNSF track. 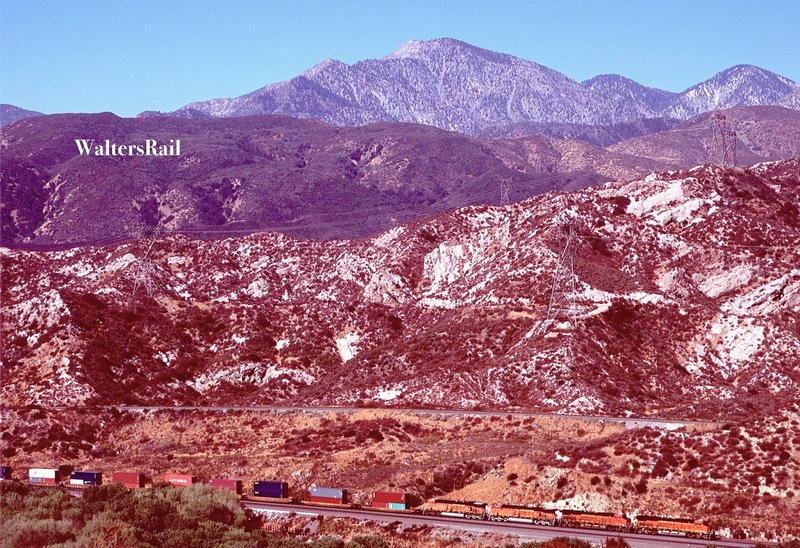 In the foreground are the Palmdale Cutoff and passing siding. Most of the railroad traffic Bear and I saw that afternoon was Union Pacific, both on BNSF tracks and on the Palmdale Cut-off. By and large, the engines were clean and sleek, a far cry from the filthy units I am accustomed to seeing on UP coal trains around Kansas City. 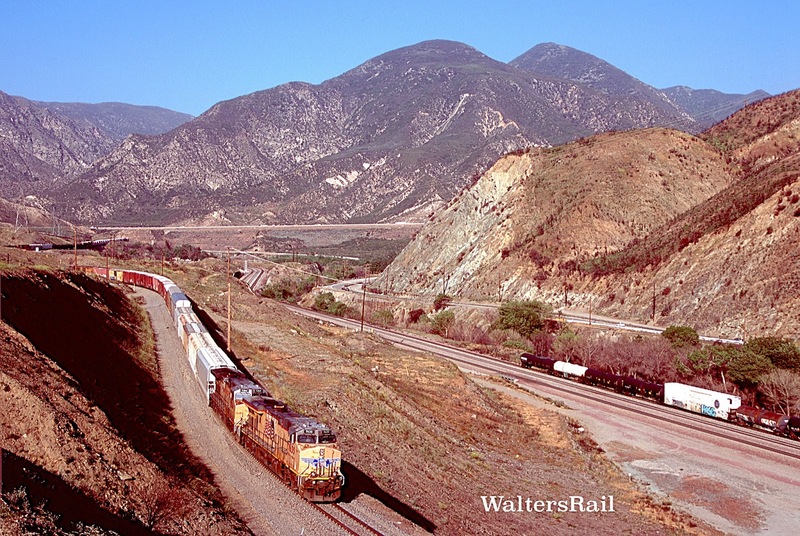 An eastbound UP Manifest is climbing the grade toward Sullivan’s Curve. 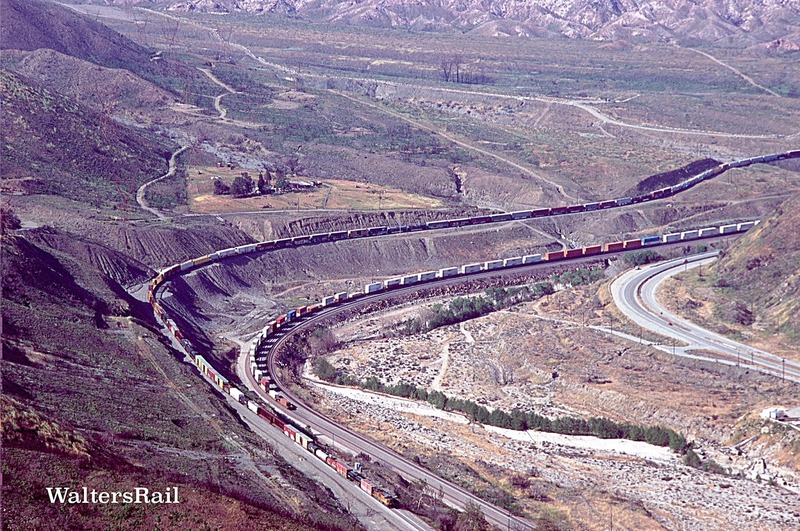 The Palmdale Cut-off approaches the curve from a different angle than the BNSF tracks. In the lower left of the image is a thin line which, as it approaches the roadbed, is marked by a short wooden pole. This is the Pacific Crest Trail. 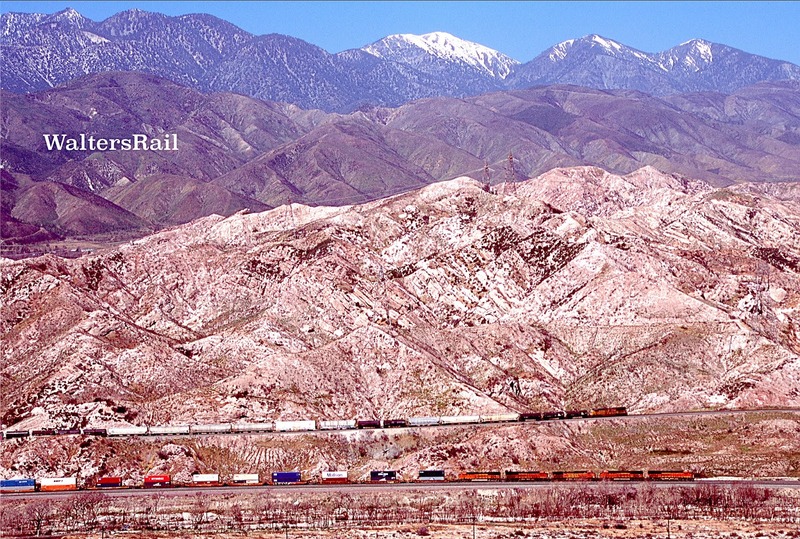 A Union Pacific manifest on the Palmdale Cut-off passes BNSF stacks and trailers at Sullivan’s Curve. In the left of the image, you can see how the UP line diverges from the original AT&SF line. 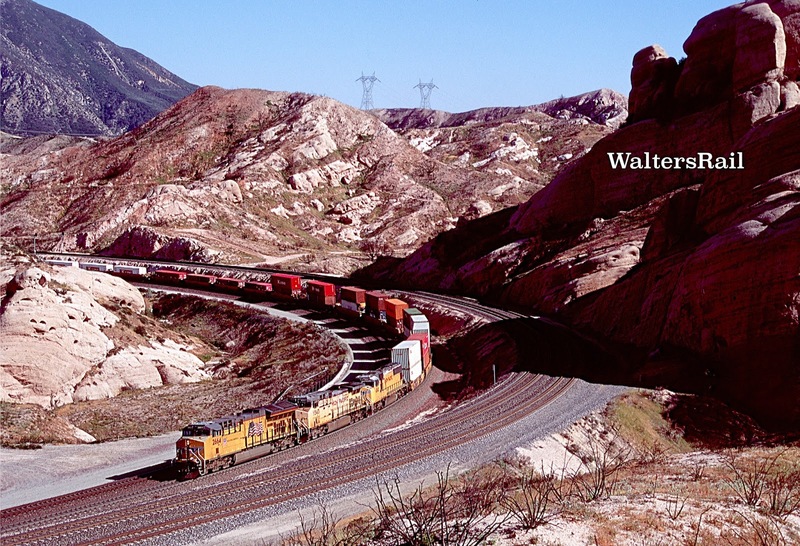 After leaving Sullivan’s Curve, eastbound traffic on both the BNSF and UP runs roughly north until approaching the Mormon Rocks, where both lines begin an arduous climb eastward. 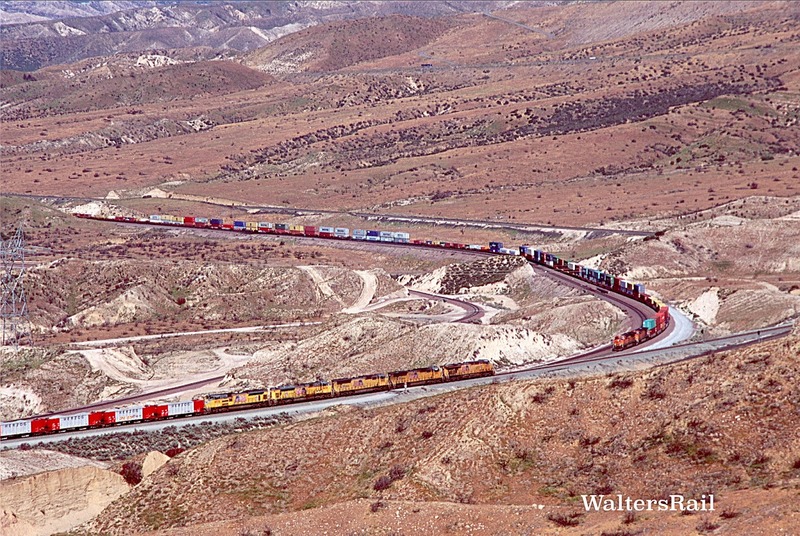 Shortly before reaching the top of the grade, both railroads then make a sweeping curve to the south, continuing to gain altitude. The stiffest part of the grade occurs here. 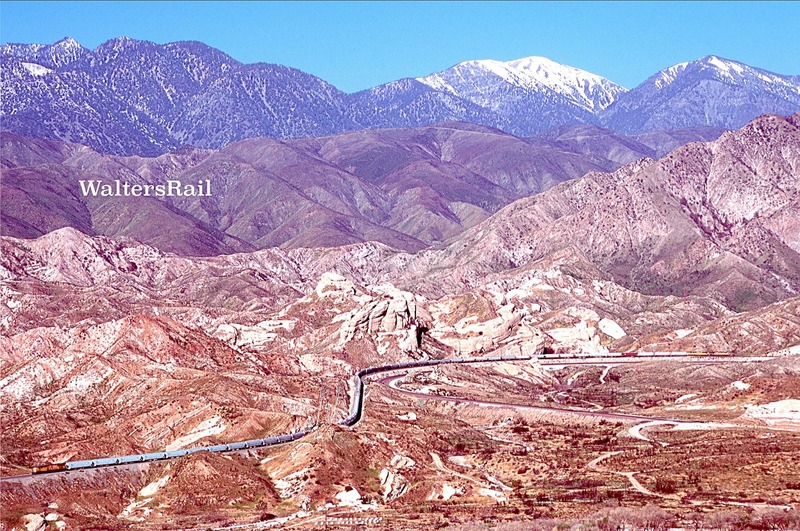 Looking north up Cajon Pass. The Mormon Rocks are right of center, where the tracks turn east. Virtually everything in this image, save the right foreground and the peaks in the background, was burned. The Blue Cut Fire roared straight up the pass, following both the tracks and I-15, which climbs the ridge on a much steeper grade and does not turn south but rather north to the summit. The fire destroyed an old restaurant and gas station at the top of the Interstate, but firefighters managed to control the conflagration before it spread into populated areas in the high desert near Hesperia. If you have a four-wheel drive vehicle and knowledge of the local roads, you can navigate through the desert to the hill that overlooks the tracks approaching the summit. A word of warning: The following images were taken from a minimum maintenance road directly beneath the twin high voltage towers and lines that run down the pass to the Los Angeles Basin. These lines crackle and pop all day like a thousand frenzied insects and create a static field that can make the hair on your arms and neck stand up. I find the experience disconcerting but not uncomfortable enough to sabotage photography. When the following images were taken, the State of California was widening and straightening State Highway 138 between I-15 and the summit of Cajon Pass. The old road was the most narrow and winding imaginable and saw significant traffic, including heavy trucks. At one time, California’s hills and valleys were criss-crossed with such death traps. Over the years, most have been eliminated. (A few still exist around Tehachapi Pass, such as Caliente-Bodfish Road.) 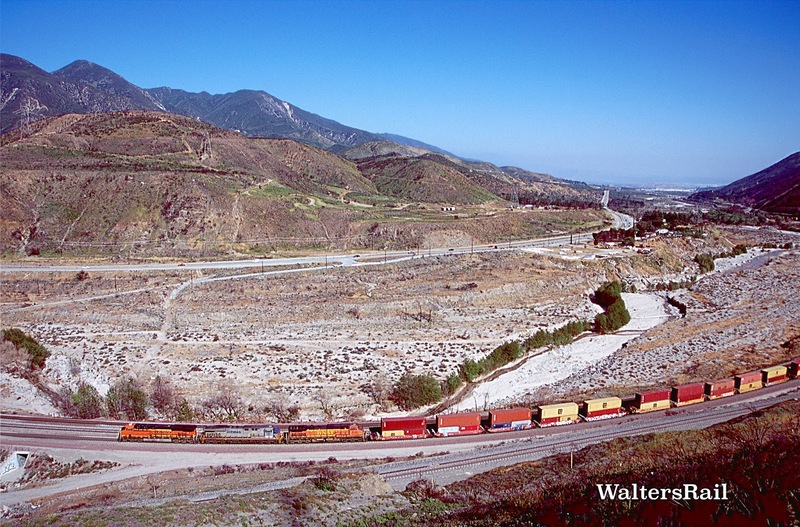 Until recently, State Highway 138, winding up and down, left and right, curving and dipping, with no possible room for passing, allowed easy access to the San Bernardino National Forest on several minimum maintenance roads to multiple locations where one could take good shots of trains ascending and descending Cajon Pass. 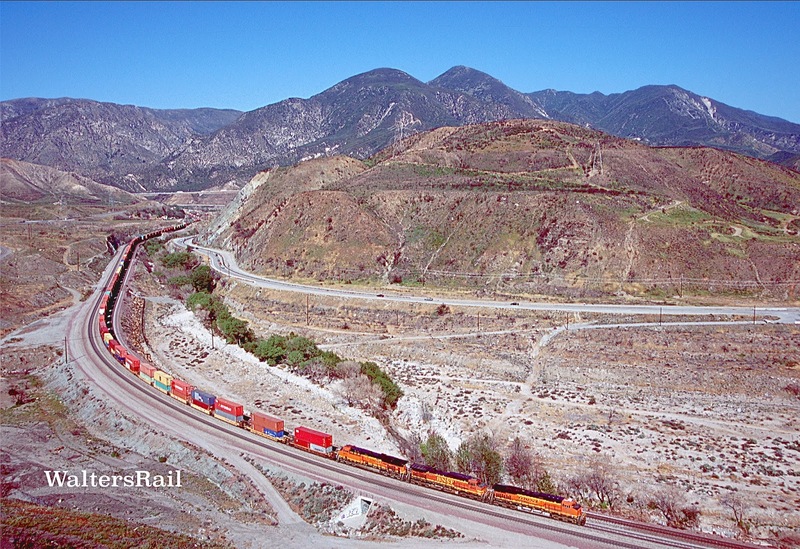 Also, one could pull off the road at the top of the grade and take excellent shots of trains climbing to the summit and turning east again. All this may be gone when the new construction is completed. 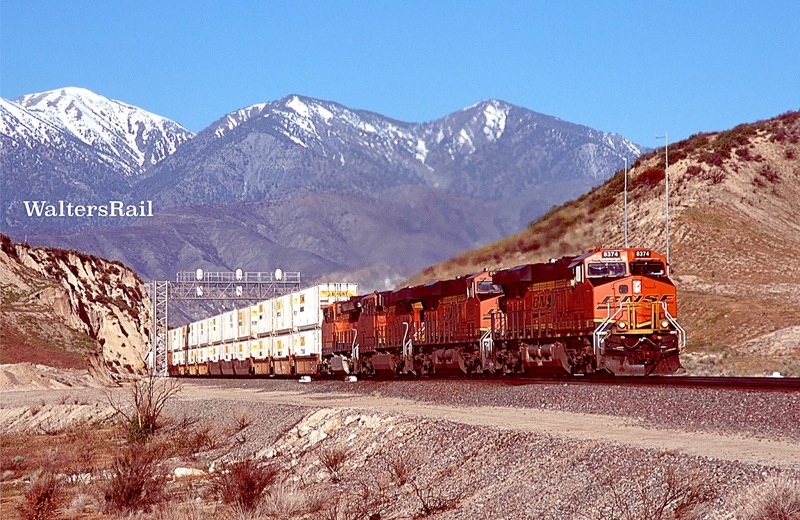 Eastbound BNSF stacks are making the turn south toward the summit, while a westbound UP rock train is gliding downgrade in dynamic breaking on the Palmdale Cut-off. The original Atlantic and Pacific mainline is visible between and west of the power of both trains. This area was thoroughly burned in the Blue Cut Fire. 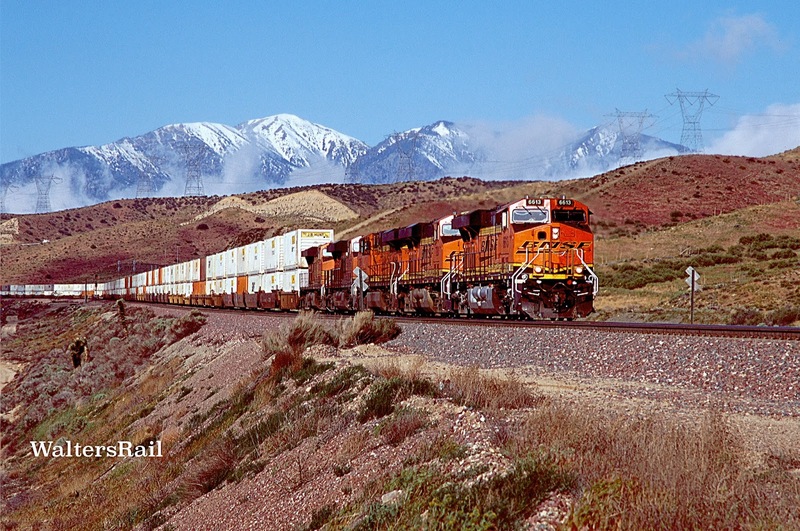 An eastbound BNSF Z Train approaches the summit on the original Atlantic and Pacific alignment. Highway 138 construction is visible in left center. 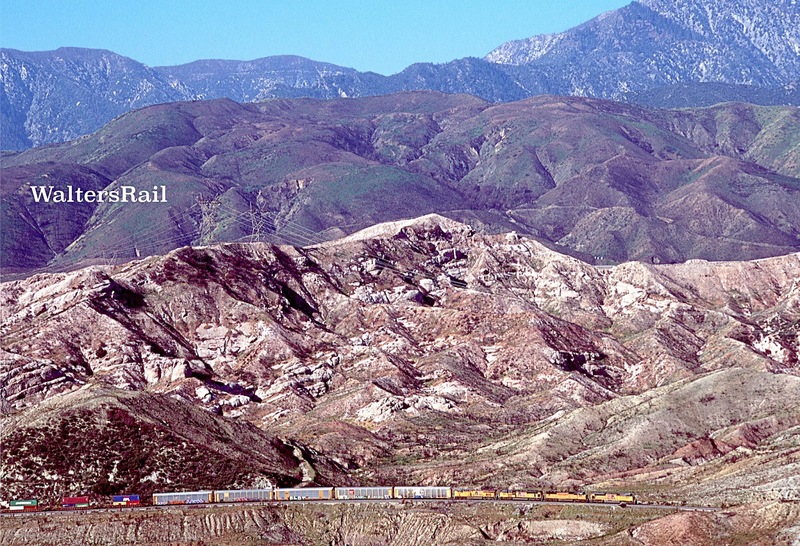 In the far distance, a Union Pacific coal train is descending Cajon Pass on the Palmdale Cut-off. 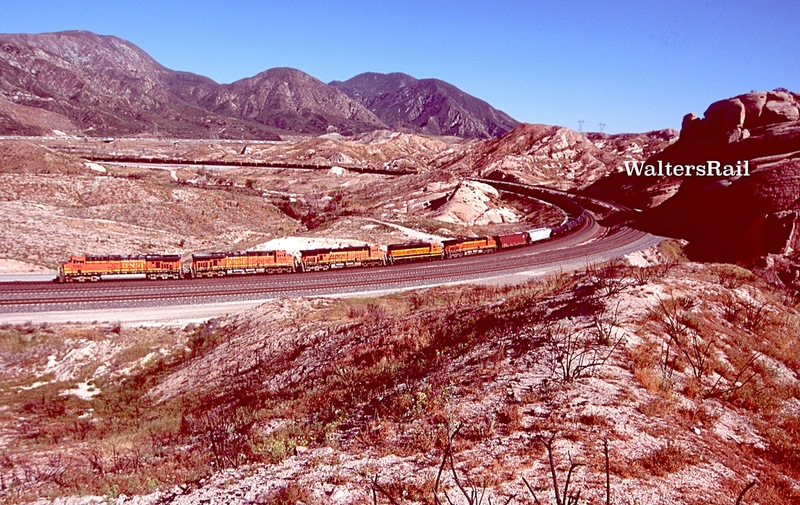 In August 2016, two weeks before the Blue Cut Fire, a BNSF oil train climbs southward on the grade to the summit of Cajon Pass. The image above this was taken from the hill behind the train, looking west. This image looks east. The photographer of the image above this was standing just out of sight to the left of this image beneath a high voltage electric tower. Compare the vegetation before and after the blaze. 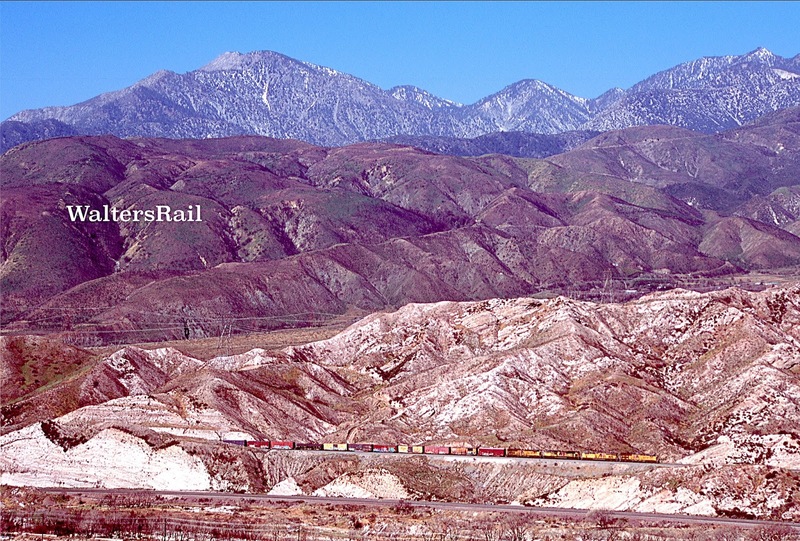 In this image, a loaded, UP coal train has just crested the summit and is beginning the descent through Cajon Pass. 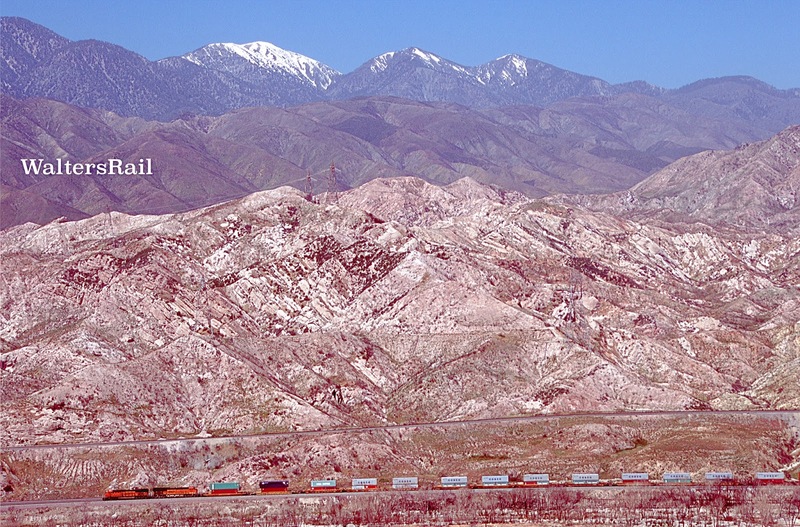 On the Palmdale Cut-off, the train is moving about five miles per hour and will pick up little speed until it turns south past the Mormon Rocks. Immediately beyond the train is the construction of new Highway 138. If you look closely, you can see small portions of the old road twisting and turning through the sand. In the left of the picture is one set of high voltage electric lines crossing the burned hills into the valley. 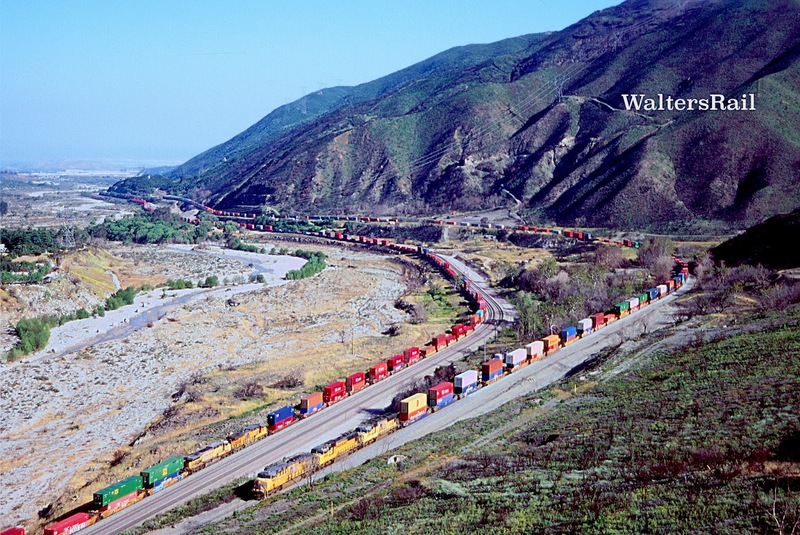 If you know where to look, you can also see I-15 and the railroad tracks at the bottom of the valley. 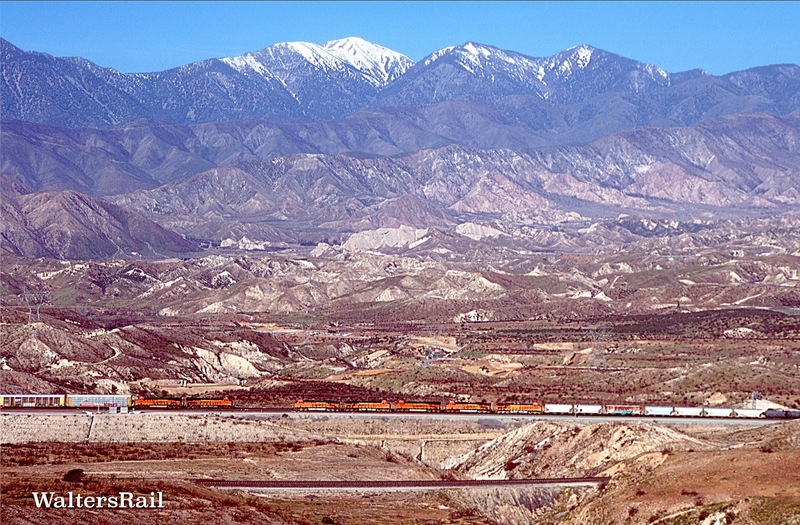 Eight units lead BNSF stacks past the beginning of the descent through Cajon Pass. Thus, the incredible landscape shown in these images resulted from the movement of the North American plate past the Pacific Plate, uplifting the terrain to enormous heights, followed by hundreds of thousands of years of erosion, combined with four separate events of massive sedimentary wash down the peaks, creating huge alluvial despots that eventually turned into schist, such as the rock at Blue Cut. I also suspect that erosion in Cajon Pass has been aided greatly over the eons by conflagrations such as the Blue Cut Fire. The image above shows a completely barren landscape from which silt and sediment can easily wash down into the valleys. 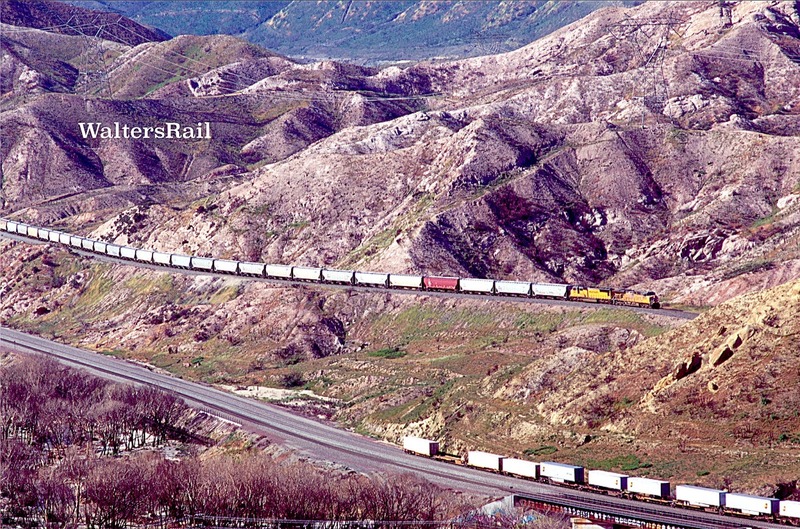 Shortly before reaching the top of Cajon Pass, trains running south turn back toward the east. This same path was followed by the Blue Cut Fire, which reached a small portion of the high desert here. No structures were damaged, however, and firefighters controlled the blaze shortly past the top of the hill. The image below was taken on a morning in late April, 2017, when fog was blowing up Cajon Pass from the Los Angeles Basin and spilling onto the high desert. 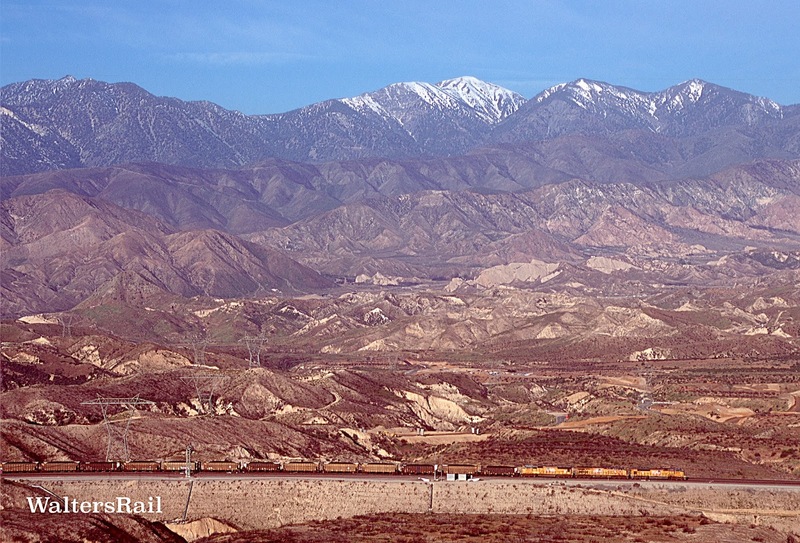 The peak of Mount San Antonio (or Mount Baldy, as many locals call it) is just visible in the upper left. The train is cresting the summit, and the photographer is standing approximately where the fire was contained. 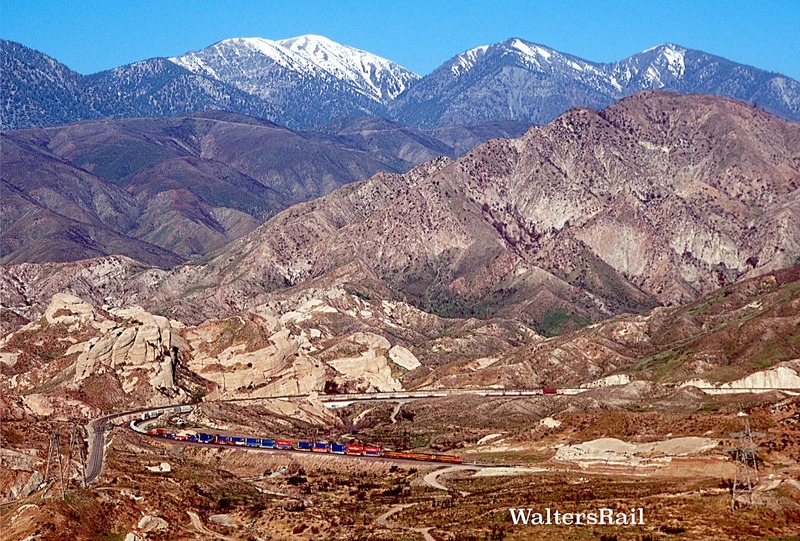 Eastbound BNSF stacks are cresting the summit of Cajon Pass in April 2017. The left foreground shows where the Blue Cut Fire stopped. When this image was taken, huge yellow earthmovers were devouring a hillside to the south, removing a favorite railfan photo location as part of the State Highway 138 renovation. 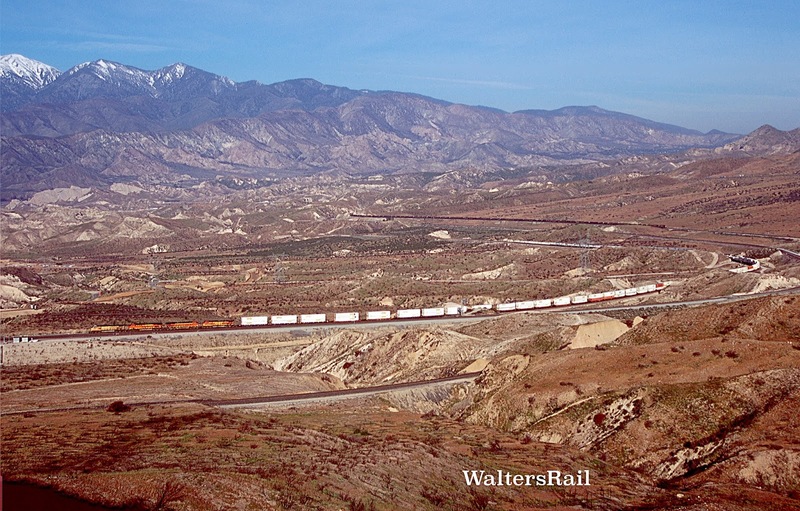 Below, BNSF 6613 East (an ES44C4) has crested the summit of Cajon Pass and is headed across the high desert toward Hesperia and Barstow. 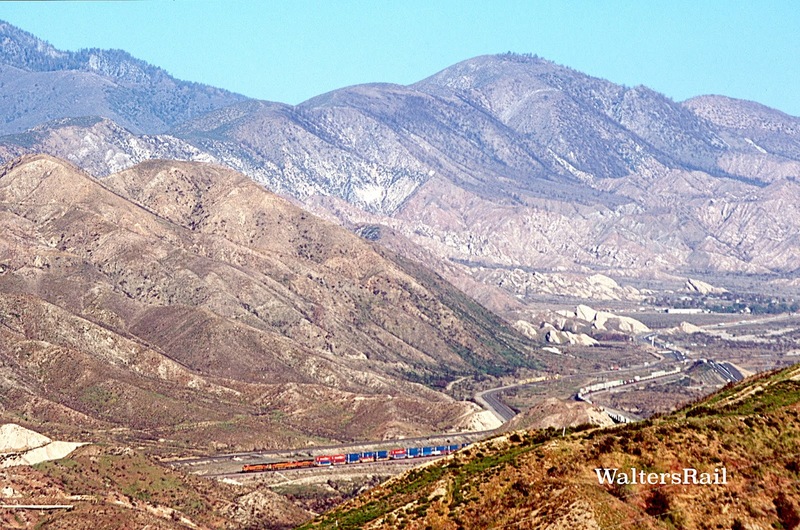 The vegetation here is what Cajon Pass looked like before the Blue Cut Fire. In years to come, the pass will look this way again. For now, however, the desert and mountain ridges need time to heal, to regenerate, to continue the ageless cycle of plate movement along the San Andreas fault and erosion of the uplifted mountains.